The women’s technology and business community in Gaza combines entities that may surprise you at first. But while expressions like crises, blockade, and war are more familiar in this context, Gaza is setting an international example in terms of inclusivity and accessibility for its aspiring entrepreneurs. Young women, especially, have revealed a great hunger and quest to be represented among the tech and business community in Gaza – similar to any other place in the world. As can be expected, many challenges have to be overcome under the current political and social circumstances; social restrictions and lack of electricity and mobility are only a few among the many challenges that entrepreneurs face in Gaza. The good news is that they have not stopped female entrepreneurs from making it happen. When a call was issued for a “hackathon” focused on solving problems related to women entrepreneurs, 83 percent of responding participants were female – the highest percentage globally in the same event series. It came as a surprise even to Gaza Sky Geeks who organized the event in partnership with another start-up accelerator, AngelHack,* and it should entice some re-thinking of preconceived ideas regarding the possibility of equal participation of Gaza’s women in society and business. “It’s true that my idea wasn’t one of the finalists, but the event pushed me to learn a new coding language only one night before the event. And the fact that the organizers believed in me was the reason that I believed in myself in the first place. In Gaza it is never easy to notice all the small victories that we accomplish every day. Today, and through this amazing and empowering community, it’s finally possible!” says Asma Almadhoun, the winner of the Best Developer Award in the hackathon. It doesn’t stop here. The next generation of Gaza’s women is setting high expectations for a prosperous and expansive community in the coming years. Programs such as Technovation Challenge and BanaTech target girls from 10 to 17 years old, and teach them to code and to build mobile-based apps to solve real-life problems. “My teacher nominated me to join the Technovation program where I was first introduced to coding. I really loved it, so I decided to continue and began to study programming on my own. As a result, I won many local prizes and joined the Gaza Challenge 3.0 boot camp,” says Zinab ElRamlawy. Her first mobile app, Fire Control, aims to reduce the number of fire accidents and the injuries that are caused by candles or electricity generators, which are used in Gaza as an alternative to the constant electricity cuts, and the lack of safety measures in the Strip. Much more is growing in Gaza besides the tech community. Another great example is the rising advocacy for debate, which enhances dialogue both among Gazans themselves and between Gazans and the global community. The diversity that can be found here is impressive. Gazans have taught themselves how to grow and expand beyond the restrictions that are being placed on their physical movement and access to the outside world. Internet and youth activities with their growing potential have opened a door that allows different belief systems and philosophes to emerge. And while the political and social situation creates all types of conversations, a space for productive and meaningful debate and dialogue is always needed. Together with Basel Almadhoun, I established the first debate club in Gaza. Basel learned debate during an exchange year in the United States, and he has since passed on to me his expertise and passion. 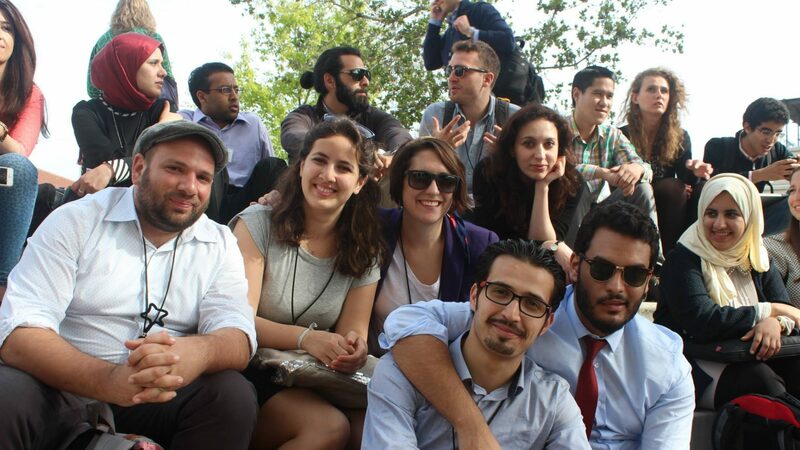 Over the course of four years, the club has developed into the Debate, Dialogue, and Discussion in Palestine initiative (DDD). Many organizations and groups have begun to adopt this culture and have helped to nurture a more open and vulnerable society. Such projects aim to reduce miscommunication and intolerance by creating a healthy socio-political environment through animating knowledge-based public discussions and debates in Gaza’s society. Thus, the aim is to spread the values of exchange of ideas, respect of each other’s opinions, and professional integrity in defending and promoting one’s own concepts in life. Setting yet another example of equal opportunity, our project has maintained equal gender participation in our debate and dialogue sessions. This has opened the space for more inclusive and reasonable thinking strategies to emerge among the participants. Gaza is showing the world that similar access to this natural diversity –which we still lack today in many areas – is beyond the limitations that are imposed on us and our minds. It’s a matter of ability to adjust to it, which has proved to be completely possible. “I had never stood in front of people or dared to speak publicly until I first learned how to listen to others carefully and accept who they are. It turned out that being listened to is not the most effective form of self-expression unless we first listen to other people. DDD has taught me such tolerance and has made me a better version of myself,” says Fatima Abu Hashem, one of the recent graduates of DDD. A closer look at Gaza will make you wonder how much people could achieve if they could free their minds, even as they engage in the necessary struggle. Hope, determination, and hard work are Gazans’ only bet for a better future. In a place where the unemployment rate has reached 70 percent among fresh graduates and where the education level is still one of the highest in the region, there’s a lot to change and a lot more to learn.